Since Margaret Thatcher’s death and her £millions taxpayer-subsidised funeral, this quote from Orwell came to mind many times. The political spectacle that followed revolved around much more than the death of a ‘frail old lady’, who just happens to be a leading architect of British neo-liberalism. Thatcher’s heirs in government dominated the airwaves and spent our tax money to celebrate a toxic heritage of austerity and repression and bolster their own regime. I also remembered a book I read many years ago, Social Amnesia by Russell Jacoby. Social amnesia describes collective forgetting: “memory driven out of mind by the social and economic dynamic of this society”. Jacoby was writing about the US in the 20th century, but we have just seen an attempt by the UK state to impose its own version of collective amnesia in relation to the Thatcher legacy. However, people weren’t having it! Those of us who had lived through the Thatcher years brought out the old banners and placards. 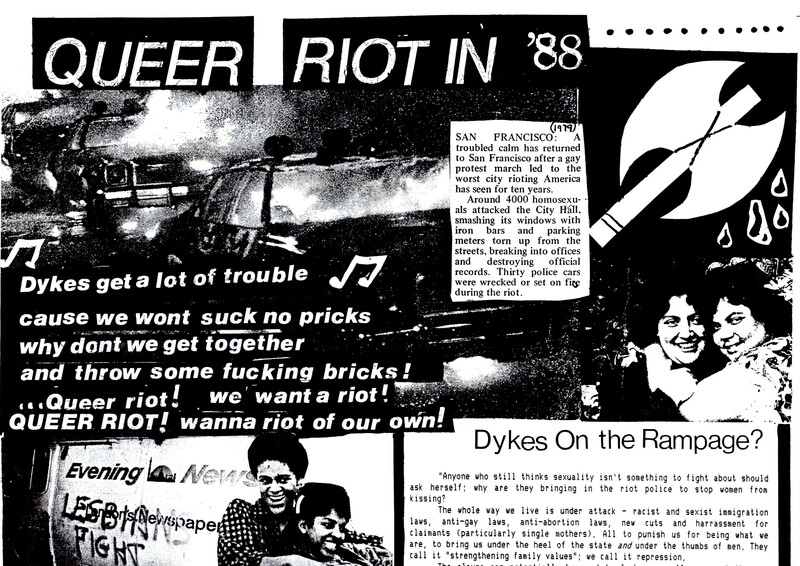 At the celebratory street party in Brixton I chatted with a couple of dykes who sported very fetching and well-preserved ‘Stop Clause 28’ t-shirts, and I met an old friend who’d done time for the Poll Tax riots. I also bumped into younger friends who were active in protests against tuition fees and now face a future of bad working conditions, low wages and insecurity – or unemployment and forced unpaid labour under workfare schemes. Though these people weren’t around when Thatcher ruled, they live with the consequences. In effect, we have just experienced a struggle over defining a past that has a massive effect on our future. History is not just for academics and officials to witter on about, but it is something we live with every day. And often, history is really made in the streets. The mass parties and confrontations, the jokes and the ‘wear red’ initiative were indeed part of a refusal of social amnesia and present-day austerity. The ‘death parties’ were also a remembrance of the victims of Thatcherite policies – our dead and injured – and a celebration of our own survival. They were a tongue-in-cheek warning that the ‘enemy within’ will continue to erupt and disrupt. Meanwhile, we had the laughable farce of the BBC virtually banning a 70-year old children’s song, “Ding Dong the Witch is Dead”. But the BBC ding-dong embargo also illustrates the power music wields for invoking social remembrance of the past, and inspiring action for the future. Media buzzed with favourites, including a list of “21 angry songs about Margaret Thatcher”. So here’s my own personal playlist. The proverbial ‘Hatred and Bile’ has certainly given us the best tunes. But many of these songs aren’t about Thatcher herself, but invoke memories of life in the world she ruled. Some reflect the era’s hedonistic side. Not all of them were favourites at the time. I wasn’t a big Frankie Goes to Hollywood or Boy George fan back then, but their songs make me smile now. And not all the music actually comes from the 80s – one ditty dates back to the 17th century. I’m also missing some essential songs – for example, I couldn’t find any videos for Poison Girls’ “Feeling the Pinch”. 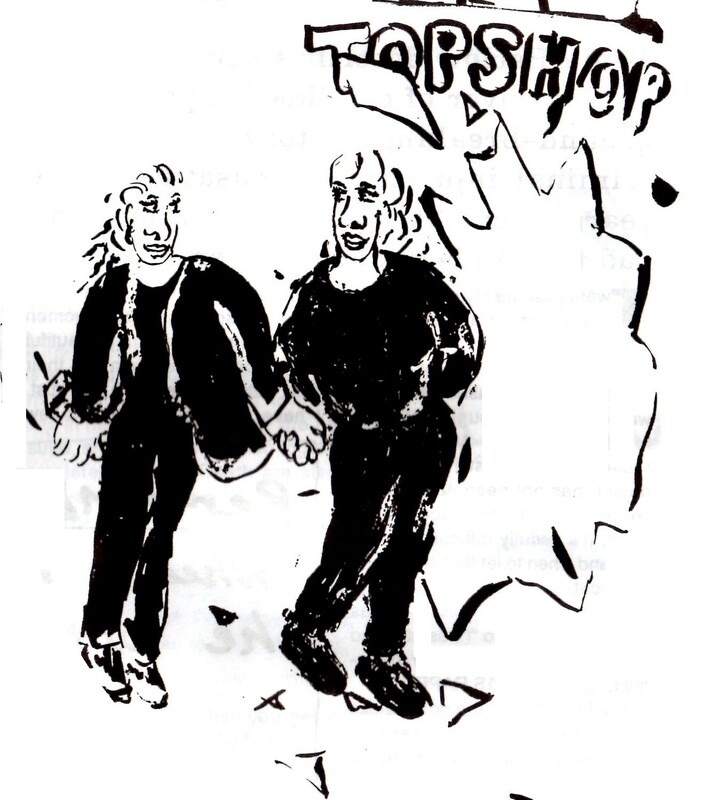 I also searched for anything by the Happy End; they were local to my patch in Vauxhall and I often went to their gigs. No luck there – but some Happy Enders later formed the Communards so we’ll hear from them instead. I was a punk, reggae, ska and folk music lover and avoided anything glitzy or pop. But this got more than a few Thatcherite jocks in a strop at the time, and it’s hilarious to watch now. This is another old song that sounds great now. Its joyousness stood out against a grey landscape then, and still does now. “You’ve never had it so good / The favourite phrase of those who’ve always had it better…” Paraphrases a similar line from Marat/Sade as well as the Tory slogan of the day. Back then the Pogues weren’t just for St Patrick’s Day. This song’s off their first album, and still a favourite… I was pleased to find this live version from The Tube. As you’d expect, it’s got a lot of period atmosphere. However, since it’s on TV the swear words are censored, which loses the flavour. But you can find an uncensored version off the album if you go to the YouTube page. At that bit towards the end of this song I sometimes thought the singer was shouting at the bass player to play faster (given that I was a bass player myself), but I suspect he was really shouting “bastards”. This song is on target given new revelations about the case of Blair Peach, an activist killed by the police during demonstrations in Southall in 1977. In this live performance, LKJ changes ‘England’ to ‘Europe’: ‘Is Europe becoming a fascist state? The answer lies at your own gate, and in your hands lies your own fate’. And if we’re playing NMA greats, we can’t leave out “Vengeance”. After Smiley’s death a couple of years ago in a police raid, this song is especially poignant. A darker take from UB40 with “Madame Medusa”. This song came along well after the 80s. In fact, I only heard it for the first time two weeks ago. But it’s catchy, danceable and angry, and it has to be played! A song dedicated to the ‘enemy within’, though it predated the phrase by four or five years. It was actually inspired by the “Persons Unknown” trial in 1979, where six anarchists were accused of conspiracy to cause (non-existent) explosions with “persons unknown”. I’ve played and sang this song many times, featuring different words and locations throughout the years – including a drunken karaoke version at a fundraiser for the MayDay 2000 actions. But I suspect most people would rather hear the original by Martha Reeves and the Vandellas. “The gentry must come down and the poor shall wear the crown…” This is going really retro… to Gerald Winstanley and the Diggers in 1649! And finally, ending with some optimistic if gritty anarcho-punk. “It’s your world too you can do what you want.” Awww bless – but it’s good to know it wasn’t all doom and gloom back then. reduced price of £10. All proceeds will benefit Freedom as they rebuild after last February’s firebombing. 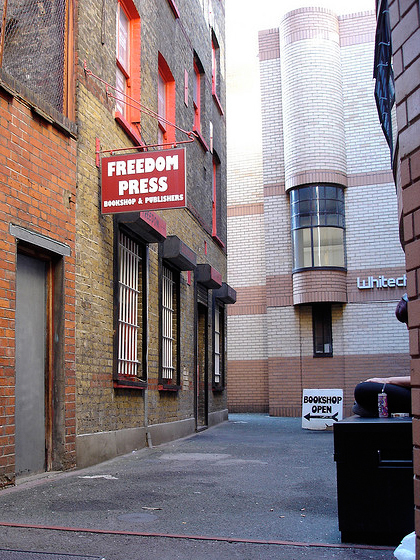 Freedom is located at Angel Alley, 84b Whitechapel High St – the nearest tube is Aldgate East. The offer will also be available through Freedom’s website. Copies are limited, so get in there fast!